Let’s see what’s new in this new version of Salon Booking System plugin. We’ve added three links inside the booking confirmation email sent to the salon customers to add the appointment inside their Google Calendar, Ical calendar or Outlook calendar. Now your customers will never forget about the appointment with you. This is a new option added inside the services settings page that allows you to hide specific services on front-end booking form. 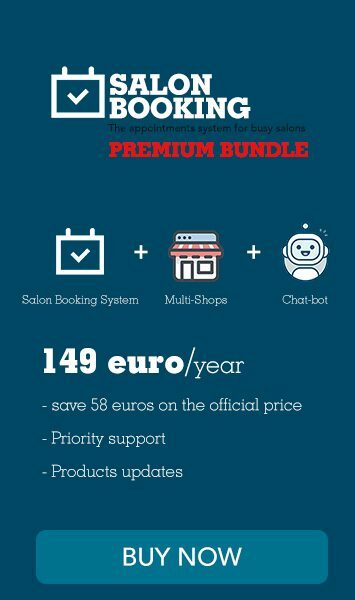 This feature is very useful if you want to create services that can be booked only by the salon administrator for specific customers. Or another interesting use is when you need to charge the customer for an extra-time required for a service then you can add this “extra-time” service to the existing reservation in order to update the final amount. Now this field can be manually edited in case you need to change the automatic sum calculated by the system and have more flexibility on the final sum to be charged. Salon Booking now supports RTL languages.